In the past few days since watching it I've tried hard to make myself enjoy "Journey to the Centre of the TARDIS" and I simply can't. 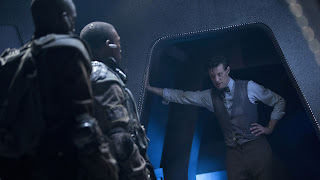 So in "Journey to the Centre of the TARDIS" we got corridors on top of corridors of the TARDIS' interior. Clara comes upon the Library (and that tantalizing tome titled The History of the Time War). We see the swimming pool (now much bigger than that little kiddie pool in "The Invasion of Time"). I noticed that the TARDIS also has an observatory (how it's supposed to work, I can't figure out). And at long last we got to see the Eye of Harmony itself. Which if you can ignore that whole "soul-sucking" business from the TV movie, was actually pretty cool. There were a LOT of sounds and bits of dialogue from the entire span of Doctor Who (including at least one from "An Unearthly Child", the very first story from November 1963). Speaking of which: books in the form of vials containing liquid. Is this Doctor Who or Harry Potter? Yes yes yes, all well and good. But I still thought that "Journey to the Centre of the TARDIS" was too flat of an episode than it should have been. Maybe it was the heightened expectations about seeing the TARDIS finally revealing its full glory to us. With more and more time since it was first broadcast/transmitted, I think the biggest problem with the episode was its execution. Having the TARDIS picked up by salvagers and The Doctor conning them into helping him rescue Clara from the bowels of his own ship wasn't the best of plot devices. Incidentally, I didn't feel much empathy for the Van Baalen Brothers, except for the very end of the episode. I'm going to give "Journey to the Centre of the TARDIS" Two and one-half Sonic Screwdrivers out of five possible, and that might be too generous. There are only three episodes left in this season, including Neil Gaiman's next entry and then the eagerly-awaited finale "The Name of the Doctor". Let's hope that Steven Moffat and crew can knock the next few out of the ballpark.